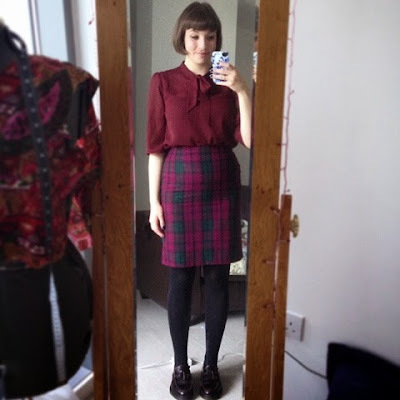 A couple of makes here that I haven't worn together before: a plain (and unblogged) Simple Sew Lottie blouse and my tartan pencil skirt made from the second Great British Sewing Bee book. This is my absolute favourite dress! Not entirely me-made, but I think I've done enough modifications for it to count. 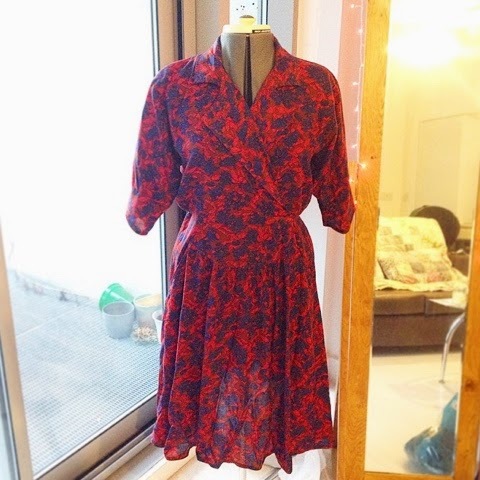 I bought the original from eBay, where it was advertised as a vintage garment, originally belonging the seller's Grandma. I shortened it from ankle length, and altered the long sleeves to shorter sleeves, gathered into a cuff. I think I'd like to do more alterations like this, but it really relies on plumping on a decent original! I definitely didn't look like this on Day 10, due to having a bit too much fun on the eve of Day 9... 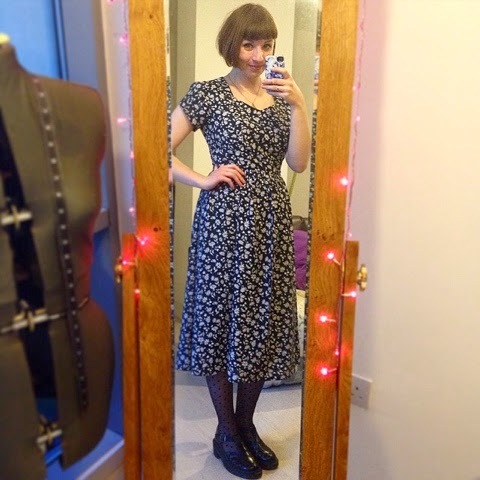 So my Liberty self-drafted dress got another wear as it was an easy one to grab and throw on. I don't often wear my red Lilou dress, but I've taken it in a little at the waist since making it, and I think it fits a bit better. It's probably a bit too short for my liking, but I did enjoy how much the skirt swished when I walked around the office at work. 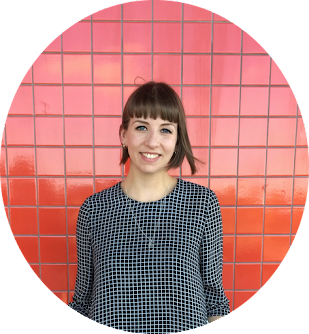 Here's a picture of me in Urban Outfitters changing rooms, where I'd been trying on clothes to work out how I could make my own versions! 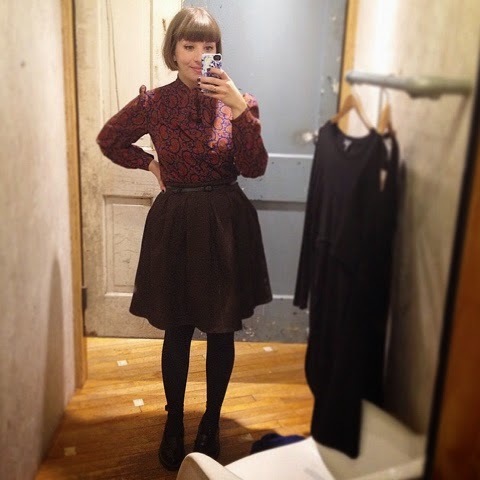 I'm wearing my Dear and Doe Chardon skirt with a vintage blouse. 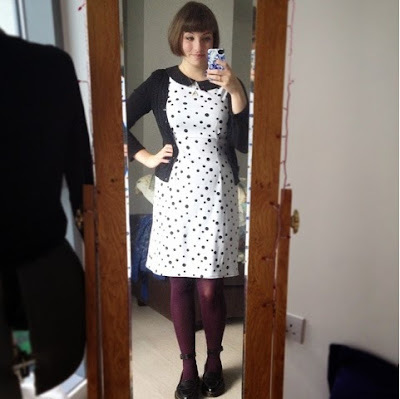 Today I wore my spotty Megan dress (with self drafted pointy collar). My dress got a few compliments at work which was nice - must be another one that I don't wear too often! 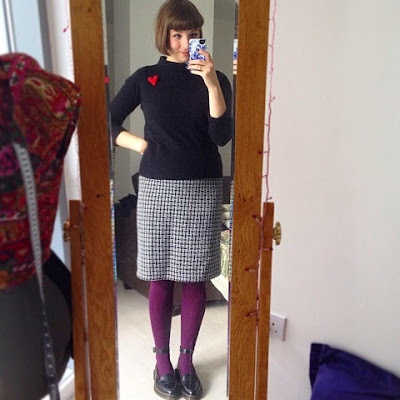 And to round up week 2, I wore this (unblogged) check skirt, with a roll neck jumper from Boden and hand-knitted heart brooch. I made the skirt from the Simplicity 2154 pattern (the accompanying blouse is much more exciting - you can see my version here). 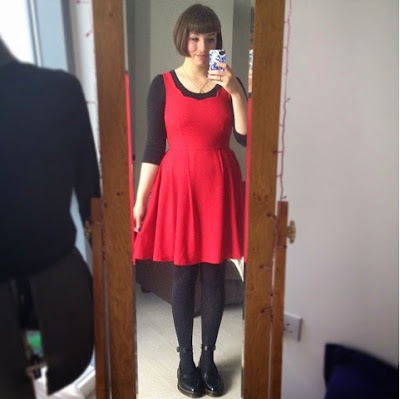 The fabric is from John Lewis, and I used the rest of it for the trims on my Mary Quant dress.